Chelsea manager Maurizio Sarri is confident a good turn he did for Fulham coach Claudio Ranieri will not come back to bite him when his side clash with the Premier League's bottom club on Sunday. Sarri, who will hope his side rebound from the 3-1 reverse by Tottenham Hotspur last Saturday, extended an invitation to his fellow Italian to watch a training session when he was in England earlier this season. “I spoke with him for three days — I don't remember exactly — one month ago, or 45 days ago,” said Sarri, who dined with Ranieri afterwards in the Chelsea training ground canteen. Ranieri, who was out of work at the time but was hired by Fulham last month after they sacked Slavisa Jokanovic, had years earlier allowed Sarri, then a banker who on the side coached amateur team Antella, to watch a training session at his Serie A outfit Fiorentina. “I went to speak to him when he was the coach of Fiorentina, 20 years ago, maybe. I don't remember very well, but I don't think he can remember this meeting,” said Sarri. Sarri has revived Chelsea since replacing Antonio Conte, guiding them to fourth in the table — seven points adrift of leaders Manchester City — and the last 32 of the Europa League. He said he studied Ranieri's teams from afar, notably the Leicester side he coached to a remarkable Premier League title in 2016. “Usually a team of Claudio is really very solid,” said the 59-year-old. “They usually defend very well, sometimes low, but very well. 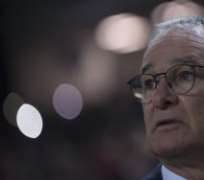 Sarri said 67-year-old Ranieri, who acquired the nickname 'The Tinkerman' during his four year spell in charge of Chelsea from 2000-2004, said he would not go so far as to classify his compatriot as a friend. “Friend is a big word, I think, but I like him very much,” said Sarri. Sarri, though, could not fathom why there had not been offers for Ranieri's services from big clubs following his sacking by Leicester in the 2016-17 campaign. “Usually the presidents are very strange,” he said. Ranieri eventually ended up managing mid-level French Ligue 1 outfit Nantes for one season, leaving them in May this year, and was at a loose end when Fulham came calling. “Usually you can live very well for two, three months, then you're in trouble,” said Sarri.